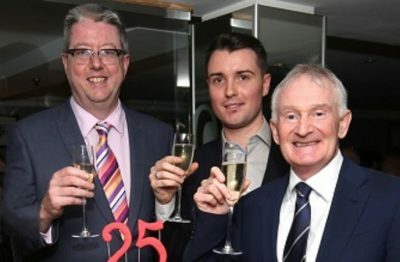 Paul Crowley & Co Solicitor’s celebrated its 25 year milestone with an exclusive event at 60 Hope Street. We honoured the anniversary with a champagne reception at 60 Hope Street on 28 January. Established in 1991 by Paul Crowley, we have built a strong reputation for providing high quality legal advice to our clients across Liverpool. Last year was a highly significant period of growth for the team; in February, we opened its new office on Old Hall Street, in Liverpool’s commercial district. The new city centre office houses PCS Law, the firm’s new commercial law department which focuses on commercial, corporate and employment law as well as commercial property and debt litigation. The property department also enjoyed significant levels of success in 2015, winning the coveted ‘Best Property Law Firm’ accolade for the fourth time at the Your Move Property Awards, which took place in October. In addition to housing a large Personal Injury department, we specialise in residential & commercial property, private client, and commercial and employment law. We are now looking to continue our impressive year in 2016. This year also sees senior partner Paul Crowley mark 34 years in the profession, having qualified as a solicitor in 1982. “The year ahead will focus on strengthening the all the firms’ departments and continuing to offer top quality customer service, which we are very proud of. I’m confident that we will build on the last few years’ success and develop Paul Crowley & Co Solicitors even further”.